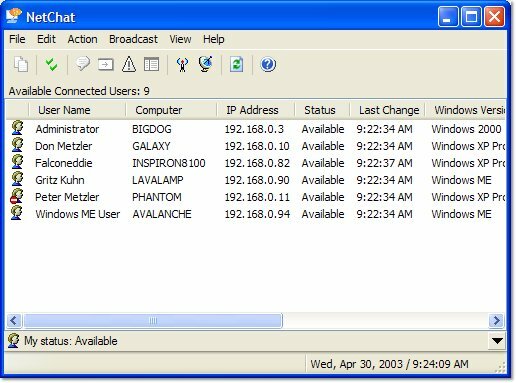 NetChat is a peer-to-peer local network messaging and communications system for Windows which does not require a server to be running for use. It allows you to chat in real-time with other users on a secure and private local network connection. NetChat is easy to use! Getting started with NetChat is very easy - just install the software on two or more computers on the local network and you may begin chatting in real-time with other users. ...... NetChat operates completely in a peer-to-peer mode, allowing efficient communication directly between users on a network. There is no server, so each message goes directly from sender to receiver, without having to be routed through a central computer on the network. NetChat works completely on a local Ethernet network using the TCP/IP protocol. However, it does not need a connection to the Internet. If you do have an Internet connection, NetChat works on your local subnet, so it will not be accessible from the outside world. Getting started with NetChat is very easy - just install the software on two or more computers on the same local network and you may begin chatting in real-time with other users. Qweas is providing links to NetChat 2.1 as a courtesy, and makes no representations regarding NetChat or any other applications or any information related thereto. Any questions, complaints or claims regarding this application NetChat 2.1 must be directed to the appropriate software vendor. You may click the publisher link of NetChat on the top of this page to get more details about the vendor.